What is a smartphone display? Many would say-a. Maybe you have heard about two displays on the smartphone. But South Korea's technology company Samsung has started thinking about three displays on a smartphone. The company has also applied for a patent application. 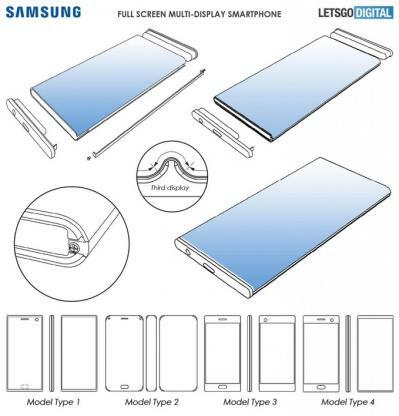 According to a technology website named Letzgo Digital, Samsung has got patent approval for three display smartphones. Understanding the flexibility of smartphones, the Samsung's three displays of smartphone are available. How will the three displays of smartphones work? According to Samsung's patent, three displays of smartphones will be different. One will be in front of the smartphone and the other two will be behind and next. There will be light bezel next to the smartphone, there will be antenna placement. According to the report, both the front and rear displays of the smartphone will be able to work differently. This can be done on multiple smartphones. It can play games on one hand and on the one hand, you can work on the internet. On the one hand such a folded smartphone will be seen in the future in such display of multiple display smartphones in the market. But when it comes to the smartphone market, nothing has been said by Samsung. Currently Samsung is working with folded and LED display. By the end of this year, the company will create 100,000 units and display 100 million units for the next year. In December last year, Samsung's mobile division head DJ Koh told that Samsung is planning to bring a smartphone folded in the Galaxy Note series by 2018. But so far no announcement of such a smartphone has been announced from Samsung.